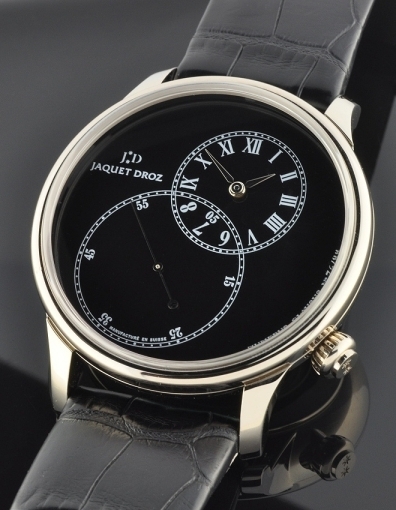 This is a very fine, massive and extremely rare hand made JAQUET DROZ Decentree 43mm., 18k. white gold with a black enamel dial having offset seconds. This watch is new-unused and pristine, with box and all papers. Only 88 of these watches were produced and this is number 76. The sapphire, exhibition case back exhibits the spectacularly crafted caliber automatic JAQUET DROZ 30 jewel movement having 68 hour power reserve. The crocodile strap is enhanced with a signed JAQUET DROZ 18k. buckle. If you are seeking a valuable investment grade watch that watch enthusiasts are raving about worldwide, this EXTREMELY RARE JAQUET DROZ is one wise purchase which I highly recommend, as I believe their value will most certainly increase “over time”. Bankwire please. Only $14.000-which is approaching almost half of its price when new.